I hope you all had a fabulous weekend! Ours was busy and HOT. I think we’ve broken almost every heat record in Texas this summer so far. I wish Austin would have crisp cool evenings, but nope. We are sweating even at midnight. We have a smallish deck in our backyard. Our back door steps out almost a full floor off the ground because of the way our yard slopes, so we have this little landing deck to catch us. Our plan is to eventually drop the deck lower and make it much larger. Decks are not cheap though, so this has to go on our long-term list instead of our get-er-done-now list. 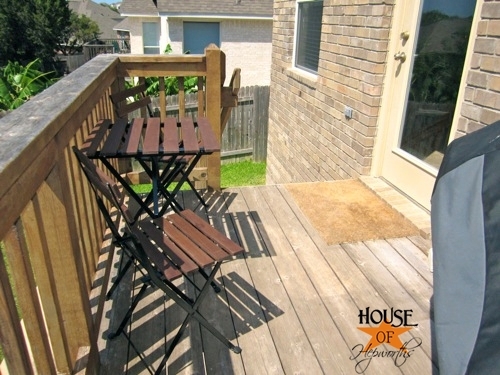 We’ve been looking for ways to make this little deck more pleasant and user-friendly, but it’s small and doesn’t leave much room to work with. 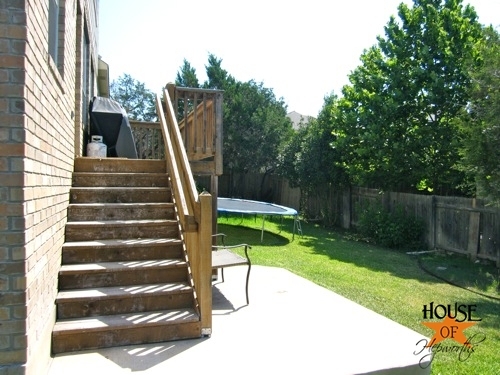 When you open the door to step out onto the deck there’s only a small area to stand and mingle, but at the same time, who wants to stand while on the deck? I’d love a few chairs to sit in and visit with a friend (once the temperature drops below the triple-digits, at least). 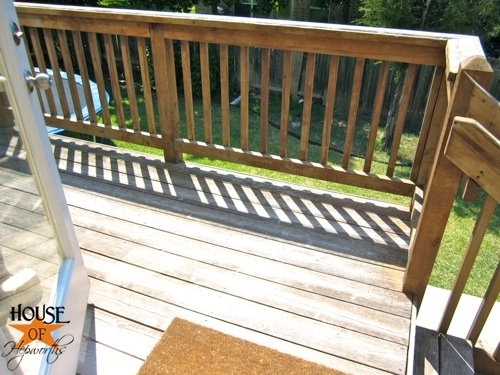 This angle really gives you a good idea as to how narrow the deck is, as well as a peek into our small yard. 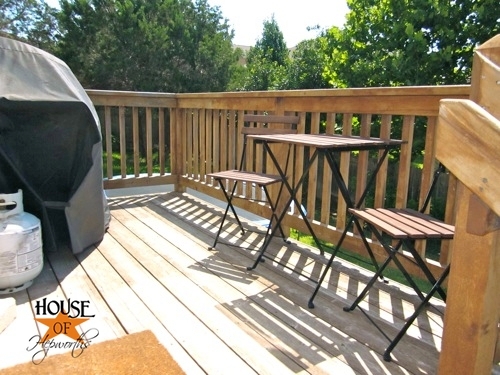 The deck pretty much gives enough room for our grill, and maybe a few small chairs. The bench at the bottom is broken, and is on my “re-purpose” list. Someday. Last month while shopping at IKEA I was beyond ecstatic to find cute little wooden folding chairs and a little table all on sale! 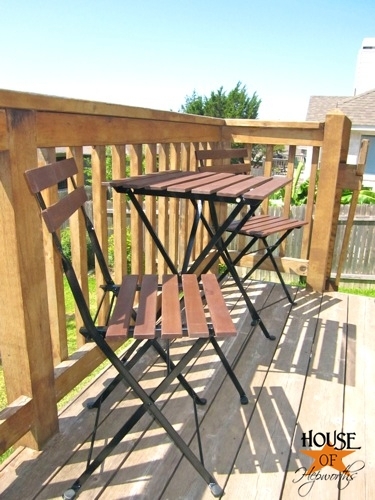 They are bistro size and I *hoped* they would snuggle in perfectly on our little deck. I figured if all else failed I could stick them on the front porch or return them, but I crossed my fingers and hoped they’d work in our little space. I raced home and anxiously opened the plastic packaging. They fit perfect! It is so nice to finally have a little spot outside to sit and visit while I watch the kids play. So far this summer we’ve had exactly ONE cool(ish) evening where I was able to sit outside and work on the laptop. This fall is going to be fab. There’s just enough space to have two people sit and relax at the little table, and still have room to walk through to the grill. The set isn’t designer by any stretch of the imagination, but I do love that it is metal and wood as opposed to a cheap plastic set. And just for fun, I set the table to make for a cuter pic. Fun! I guess I need to add power washing and re-staining the deck to my never-ending list of things to do around here. 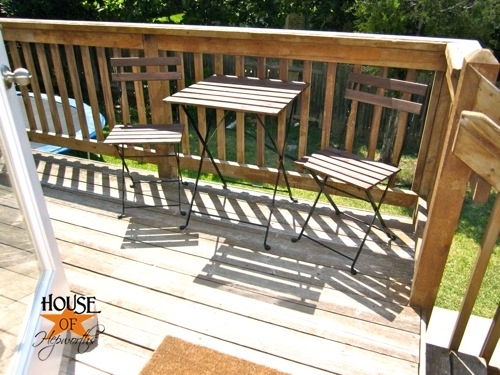 But at least for now, we finally have somewhere to sit our hineys when we want to get some fresh air. Do you like little bistro sets? Do you prefer table-height or counter-height sets? 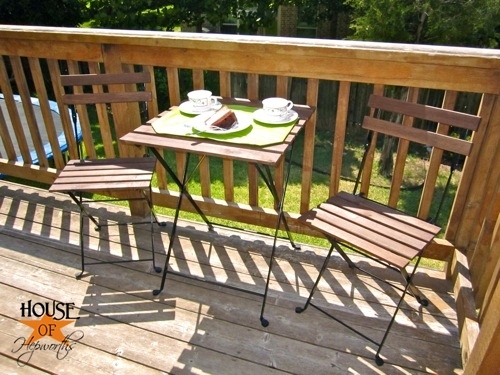 Love the Bistro set! And what a deal! Just love IKEA and a little jealous that you are closer to one than me!! (I am down in SA!) But I am just as over this HEAT!!!! Cool temps and rain, please!!!! that’s just the perfect little set to go there! What a great little set. I’m so glad you were able to find one that fit. We enjoyed sitting/eating on our deck in the early summer, but it’s been too hot to do any of that lately. Like you, I’m anticipating fall. 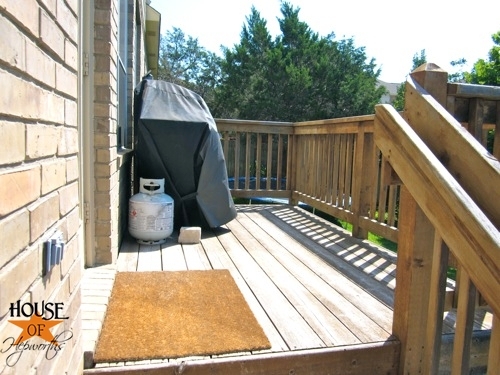 From looking at this picture, it looks like if you turned the grill and put it against the far edge of the deck so that it is facing the table, it might give you a little more room. Of course, if you have it hooked up to a gas line coming out of your house, that won’t work. Nonetheless…looks great! We live on our back patio and in our backyard for about 9 months out of the year – worth the work. I do like this bistro set! I may have to go get one for my porch! Love the bistro set! 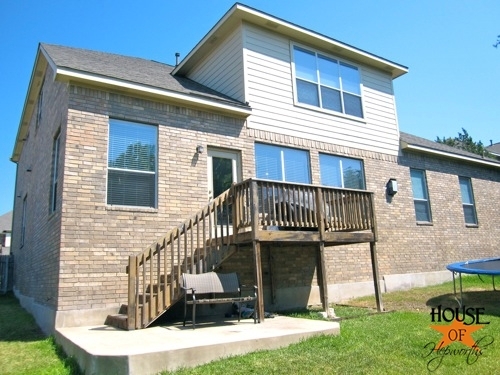 We have a similar one that we’ve loved in a front porch and a deck! Glad this set worked out for you! I bistro set is so cute and just perfect! I love bistro sets. My friend bought me the cutest little round table. She wanted it to be in time for my daughter’s birthday but it came cracked and had to replace it at Home Goods. One day I went on my porch and there it was with a huge pink bow and a card. I was totally thrilled. Don’t you love surprises? 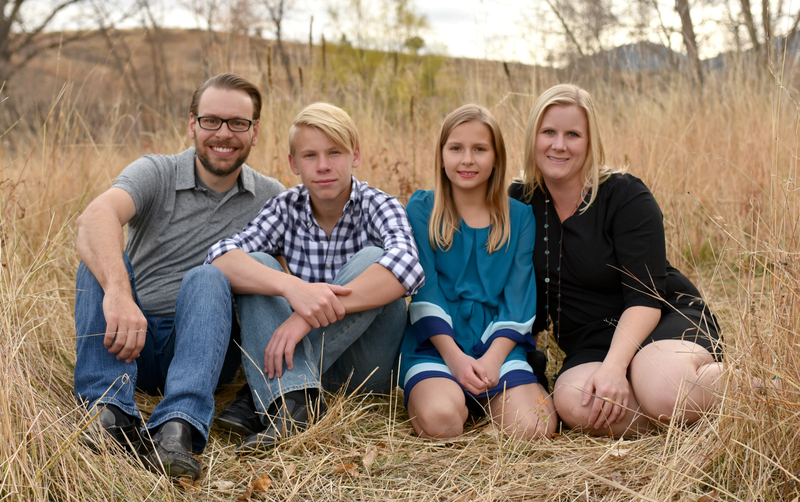 I’ll have to post a picture on my blog…Um where did my daughter loose my camera again….sigh! Dang! $25!! 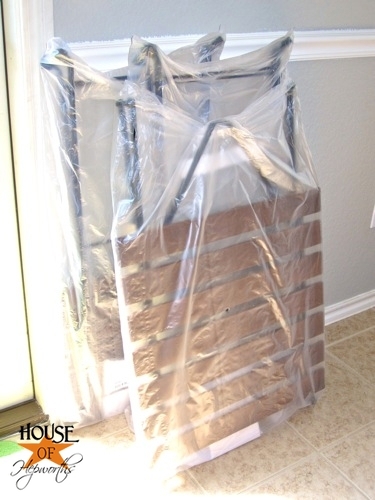 I was looking at that set for our patio, but it was online as separate pieces and would be like $50 or more! Wow! What a good deal!